Last night I saw A Chorus Line on Broadway. ACL was my first Broadway show, in 1977, when I was a teenager making my virginal visit to New York City. I will never forget the night. 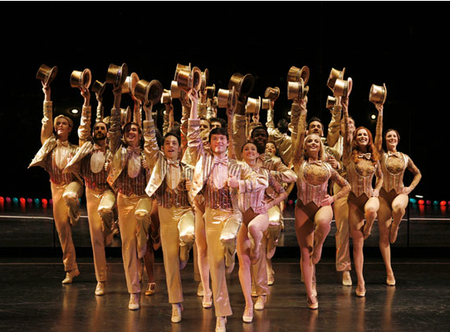 Today, I give you my Top 11 reasons why a LOVED A Chorus Line in its new revival. Do yourself a favor. Don't miss it. Michael Bennett’s choreography. Too perfect for words. The show is timeless, despite being set in 1975. It captures the hopes, dreams and realities of chasing your passion, whatever the hurdles. The new cast – excellent across the board. My friend Brad Anderson is in it, and he’s never looked better. Go Brad. “Hello Twelve, Hello Thirteen, Hello Love.” The ultimate ode to teenage angst. Paul’s coming out story, which is as moving in a post-AIDS world as it was in a pre- (I’d worried about that). Deidre Goodwin as Sheila. Every line she delivers is a winner. The lighting and set. So simple. So perfect. The thrill of revisiting a play that you know well, but that feels new because of the ways YOU have change. "Everything was Beautiful at the Ballet." Try not to cry. The final number, One. In my opinion, the best dance number ever staged. Photo Credit: A Chorus Line website. There are so many things to love about the changing seasons. But none is more loveable than the show of Fall Colors that is just starting to creep across the U.S. Today's post is a tip of a great site to explore if you want to take in the colorful leaves, wherever you are. It's called Intellicast, Weather for Active Lives. 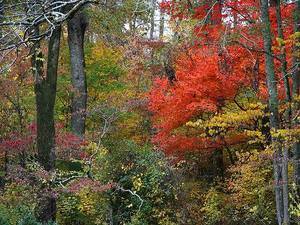 The site features state foliage reports, foliage festivals, Scenic Drives and a whole lot more. Get out there and enjoy! What's this, you ask? Why it's a map of the world, of course. More specifically, it's a map of the world where everything red is a country visited by Yours Truly. How did I make this map? I went to a website called World66. It's a newish, user-generated travel guide with many extras, including a tool that allows you to create a map of the world based on the countries you have visited. There are lots of other nifty things you can do on World66.com, so check it out. Seeing the map is kind of humbling for a cocky traveler like me. It indicates that I need to spend considerably more time in Africa. And also in the Middle East. Sadly the latter is unlikely to happen anytime soon. Thanks to both Billy and Trey for tipping me off to this site ... and thanks to Russia, China, and Brazil for being so big that it looks like I've really been on the move. A careful review of the records for the reported incident indicates that the actions taken by our crew members were reasonable, non-discriminatory, and struck the right balance in maintaining a safe, comfortable, and respectful travel experience for all passengers on-board the aircraft. Being a leader in diversity is challenging given our large and diverse customer base, but our commitment to welcoming all customers remains unchanged. 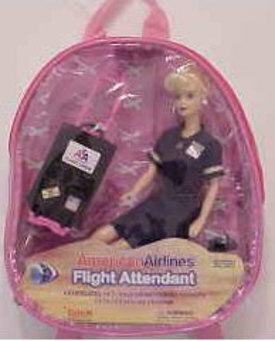 Personally, I'll trust AA and accept that the the gay couple was engaging in more than small air kisses. But my hunch is that it is a rare customer who would complain if a straight couple was similarly inappropriate, and if such a complaint were made, few pilots or flight attendants would tell the smoochers to stop. The greatest of many great things about New York City is its mix of cultures. People of every race, country, religion, age and viewpoint live here, and we find a way to share ideas, respect differences, and celebrate individuality. I love the mix-up of New York. 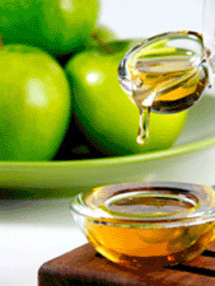 And I had a chuckle this weekend when my friend Paul – a native Chicagoan of Italian ancestry with 20+ years in NYC under his belt – proved himself far more familiar with the Jewish rituals of Rosh Hashana than I – a native St. Louisan of JEWISH ancestry with 20+ years in NYC under his belt. He rattled off "Shana Tovah" (Good Year) without missing a beat, and he accurately corrected my statement that Jews cast stones into the water to make a wish ... with the note that it's actually a ritual to cast away their sins. Me ... embarrassed. Here's to a healthy and peaceful Rosh Hashana, Autumn, Ramadan or whatever else you're celebrating or observing in the coming weeks. You may be wondering, "Why the Mountaineer Series?" Here's why. 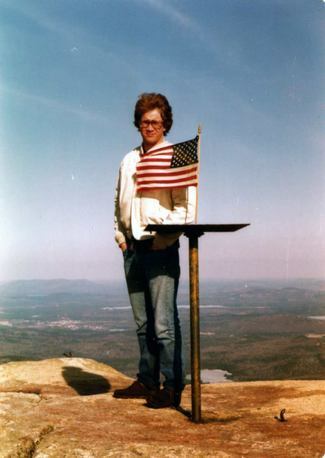 I was supposed to go camping in the Catskills this weekend with my friends John and Paul ... and climb a few of the tallest mountains in the range. 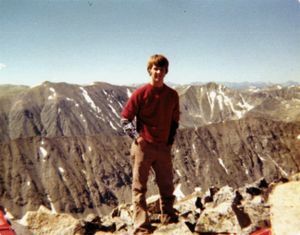 I thought I'd build up to the dramatic Summit photo with a few Summit photos of my past. Thus, the two previous posts. Sadly, it rained all weekend. We decided to forego the camping and mountaineering expedition. Instead we drank tequila, played Scrabble, ate voraciously, dished the dirt, read the Times ... oh yeah, and we went on a hike in the mist. It was a beautiful hike, and this shot is the evidence. 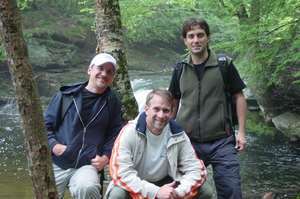 John, Paul and I are committed to camping and climbing soon, and when that happens, you will see the view from the mountain top. Because I'm a mountaineer. Thanks for your patience. Photo credit: Paul – John's B-F – a mountain man himself. Sep 25, 2006 12:01:00 AM | Americas, Where Am I? Sep 24, 2006 12:01:00 AM | Americas, Where Am I? Sep 23, 2006 12:01:00 AM | Americas, Where Am I? Imagine a news aggregator that lets you see what is happening in the world every hour of the day ... by showing a small block of 100 pictures. Now stop imagining, and check out 10x10. 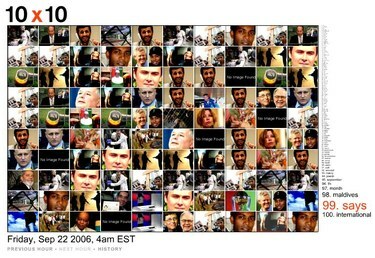 This great little site scours various web news sources to determine what is happening in the world, and then creates a block of 100 images an hour to represent that hour in time. It's awesome. And it's just one of many innovative websites developed by Jonathan Harris, " ... an artist working primarily on the Internet. His work involves the exploration and understanding of humans, on a global scale, through the artifacts they leave behind on the Web." Bottom line: The guy's a genius. Now go ahead ... explore an hour of the world. If you live in New York City, chances are you love tall buildings. I do. And I do. I recently stumbled upon a website created by MoMA, profiling 25 amazing tall buildings around the world. Some have been built. Some will never be built. And some are being built. It's a very cool website, so check it out. Of particular interest (and some sadness) are two renderings of non-chosen finalists in the competition for the new World Trade Center. They're a reminder of what might have been had imagination and creativity won the day in this highly complicated rebuilding process. Of course many a great building design never gets built, which is part of why this site is so enjoyable.